FLUIDTECQ Enters Into Manufacturing Pipeline Valves. After successful 15+ years of manufacturing Solenoid valves, Pneumatic Cylinders and Rotary actuators, Fluidtecq has ventured into manufacturing Ball valves, Butterfly valves and Knife Edge Gate valves. Ball Valves are manufactured in a range of material varying from CI, WCB, CF8 and CF8M. 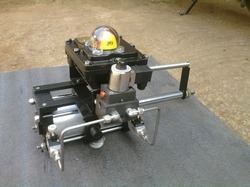 The Ball Valves are available in manual as well as pneumatic operation. Butterfly Valves are launched in Wafer Style design confirming to BS 5155, available in wide range of size, material and manual / gear or pneumatic operation. Knife Edge Gate Valves are introduced for all applications ranging from paper/ pulp industries, pneumatic conveying, powder/ash handling, temperature application, etc. 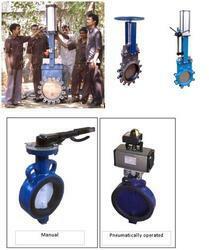 These valves are also available in manual / pneumatic operation. Uni-directional / Bi-directional valves are available. Sizes from 3" to 30" - higher sizes are also available. Round / Square / Rectangular ports. Pneumatic Cylinder integrated with Flameproof Limit Switch Box to give local on-off indication as well as feedback on PLC panel. Simple and compact design includes solenoid valves, flow control valves, SS tubing.